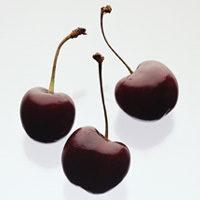 Like many other allergies to fresh fruits and vegetables, cherry allergy can take two different forms. In the North of Europe, a milder form of cherry allergy is associated to birch-pollen allergy due to the similarity between a protein in birch that causes birch-pollen allergy, and a cherry protein. This is called the birch-fruit syndrome with symptoms confined largely to the mouth, causing a condition called “oral allergy syndrome” (OAS). The molecule, known as an allergen, involved in this kind of allergy does not survive cooking. Therefore, people who react to this allergen can tolerate cooked cherry. Individuals with cherry allergy might develop adverse reactions to other fruits including apple, pear, apricot, nuts such as hazelnut, or vegetables such as celeriac (celery tuber) and carrot. In Mediterranean countries, people with cherry allergy do not have birch-pollen allergy. Instead they often have allergy to peach. These individuals develop adverse reactions to cherry because of the similarity between the allergens in peach and cherry. Symptoms are more severe including generalised urticaria, abdominal pain, vomiting and life-threatening symptoms, sometimes in addition to the OAS. The allergen that causes this kind of allergy is tough and the allergenicity survives in processed foods such as jams and juices. As a result, individuals with this kind of allergy cannot eat even cooked fruit. They also tend to develop adverse reactions to other fruits including apple, peach, apricot, plum, and nuts such as hazelnut and walnut. Several studies have reported symptoms of cherry allergy. They include oral allergy syndrome (OAS) with mild itching of the lips, tongue or throat in patients with reported allergy to cherry and a positive IgE CAP to birch pollen (Scheurer et al. 2001). Other symtoms less frequents are urticaria, angioedema, severe dyspnea, cough, and gastrointestinal symptoms accompanied by severe pain after cherry consumption. (Ballmer-Weber et al. 2002) (Scheurer et al. 2001). Purified allergens (recombinant (r) Pru av 1; rPru av 4; and lipid transfer protein: rPru av 3), commercial cherry extacts and home-made extracts as follows. Fresh fruits were cut and homogenised in acetone/dry ice at -60 to -65°C and the mixture was stored overnight and cooled with dry ice. The resulting precipitates were washed twice with acetone (–60°C) and once with chilled acetone-diethyl ether (1:1, –60°C). The filter residue was lyophilized. 2 gr of the obtained acetone powder was extracted with 30 mL of PBS (0.01M potassium phosphate and 0.15 M NaCl (pH 7.4)). The suspension was centrifuged for 45 minutes at 20,000g, and the supernatant was filtered through a fiber glass prefilter (Ballmer-Weber et al. 2002). Pastorello et al. 1994 used histamine dihydrochloride (10 mg/mL) as a positive control, and the glycerol-containing diluent of the prick solution as a negative control. A wheal graded at least 2+was regarded as positive. Ballmer-Weber et al. 2002 used histamine dihydrochloride (10 mg/mL) as a positive control, and the glycerol-containing diluent of the prick solution as a negative control. A wheal size of 7 mm2 or greater was regarded as positive. 79 subjects were included in the study: 24 Swiss patients (group 1) with a positive double-blind placebo-controlled food challenge result to cherries, 23 patients with birch pollen allergy but without cherry allergy (group 2), 23 nonatopic subjects (group 3), and 9 Spanish patients with a history of a cherry allergy (group 4) (Ballmer-Weber et al. 2002). All patients of Pastorello et al. (1994) showed a positive SPT. 19 patients allergic to birch pollen and cherries (Scheurer et al. 1997). 101 German patients with a clinical history of OAS to cherry and birch pollen and 7 Italian patients with reactions in open food challenges to cherry (Scheurer et al. 2001). 89 % of the patients had IgE to rPru a 1 with 18 sera from 19 individuals having IgE which reacted with cherry extract. For all the patients the maximal histamine release was at a concentration of 0.01 mg/ml (Scheurer et al. 1997). Proteins from cherry extract were separated by sodium dodecylsulfate polyacrylamide gel electrophoresis (SDS-PAGE) under nonreducing conditions. Purified recombinant profilins were separated under non-reducing conditions (Scheurer et al. 1997). Proteins from cherry extracts were separated on 12% SDS-PAGE under reducing conditions(Inschlag et al. 1998) (Scheurer et al. 2001). Proteins were separated by means of SDS-PAGE by using a Bio-Rad Mini Protean cell. The 15% separating gel was overlaid with a 5% stacking gel. Recombinant Pru av 4 was reduced with 1,4-dithiothreitol and rPru av 1 and rPru av 3 were applied under nonreducing conditions (Ballmer-Weber, et al 2002). The proteins were electroblotted to a nitrocellulose membrane, pore size 0.2 to 0.45 µm using a Trans-Blot Cell. The membrane was blocked with phosphate-buffered saline pH 7.4 with 0.5% (v/v) Tween 20 and incubated with the sera (diluted 1:4). The IgE-binding components were detected with iodine 125–labeled anti-human IgE antiserum diluted 1:4 (Pastorello et el. 1994) . The proteins were transferred onto 0.2 µm of nitrocellulose membranes by means of tank blotting. The nitrocellulose membrane was blocked and incubated with patient sera. IgE antibody detection was performed with alkaline phosphatase-conjugated mouse anti-human IgE (1:750) and blots were developed with the AP Conjugate Substrate Kit (Ballmer-Weber et al. 2002). 88% of sera (16 of 18) of Pastorello et al. 1994 , showed Ig E binding to a 13 kDa protein and 77% (14 of 18) to a 30 kDa protein . The other IgE -binding components were: 20 kDa (8 of 18, 44%), 70 kDa (7 of 18, 38%), 14 kDa (6 of 18, 33%), 48 kDa (5 of 18, 27%), 17 kDa (3 of 18, 16%), and 50 kDa (3 of 18, 16%). Of the seven patients with negative responses to birch pollen, five showed only one IgE-binding component at 13 kDa, and two (patients 5 and 6) also had a second band at 30 kDa. IgE from all tested sera (6/6) reacted with a dominant band of 18-19 kDa in the cherry extract. Additional bands of lower intensity (15 kDa) were recognised by four sera and of higher molecular masses (34, 55, 65 kDa) by two sera (Scheurer et al. 1997). All patients with allergy to cherry (13/49) showed reactivity to the cherry profilin (Scheurer et al. 2001). 92% of sera of Ballmer-Weber et al. 2002 showed IgE binding to cherry extract on immunoblots. All patients' sera positive to one of the recombinant allergens reacted with polypeptides in the molecular weight range between 9 kDa and approximately 18 kDa, corresponding to Pru av 1, Pru av 3, and Pru av 4. In addition, weakly IgE reactivite polypeptides were observed in the higher molecular weight range (>50 kDa), which probably represents proteins with cross-reactive carbohydrate determinants. No IgE reactivity was found against a putative 23-kd allergen, which has been described as a thaumatin-like protein. Cherry (Pastorello et al. 1994)  and/or blind (Ballmer-Webner et al. 2002). DBPCFCs were performed by means of a 2-step spit (local mucosal challenge) and swallow procedure. Two different drinks, identical in color, texture, and taste, were prepared contained 75 g of pitted cherries, 15 g of wheat flour, 10 g of cabbage, 6 teaspoons of mint syrup, 15 g of cocoa, a pinch of saffron, and 135 g of water mixed in a blender. The placebo drink contained the same ingredients but no cherries and, in addition, 13 g of sugar and 27 g of beetroot juice (Ballmer-Weber et al. 2002). Blind:Either open or blind challenges. 79 subjects were included in the study: 24 Swiss patients (group 1) with a positive double-blind placebo-controlled food challenge result to cherries, 23 patients with birch pollen allergy but without a history of cherry allergy (group 2), 23 nonatopic subjects (group 3), and 9 Spanish patients with a history of a cherry allergy (group 4) (Ballmer-Weber et al. 2002). 3.3 g of cherries (Ballmer-Weber et al. 2002). In the DBPCFCs 16 patients complained about symptoms strictly localized to the oral cavity (oral allergy syndrome, OAS). In 7 patients, symptoms were not restricted to the oral cavity but also dyspnea, dysphagia, rhinitis, gastrointestinal symptoms. One patient was not challenged because she had a severe allergic reaction with urticaria, angioedema, severe dyspnea, cough, and gastrointestinal symptoms accompanied by severe pain after cherry consumption. Subjects with birch allergy and no history of cherry allergy (group 2) and non-atopic (group 3) did not experience any reaction during open provocation with fresh cherries (Ballmer-Weber et al. 2002). Clinically relevant cross-reactivity between cherry and peach has been observed by immunoblot inhibition (Pastorello et al. 1994) . Scheurer S, Pastorello EA, Wangorsch A, Kastner M, Haustein D, Vieths S.
Recombinant allergens Pru av 1 and Pru av 4 and a newly identified lipid transfer protein in the in vitro diagnosis of cherry allergy. Five overlapping recombinant Pru av 1 fragments representing the entire amino acid sequence corresponding to the 'P-loop' region, with lengths of approximately 60-120 residues have been investigated. Weak IgE binding capacity was measured exclusively with Pru av IF4 (residues 1-120) by immunoblotting, but none of the fragments showed allergenicity in the rat basophil leukaemia cell mediator release assay. Site-directed mutagenesis experiments with Pru av 1 revealed that amino acid S112 is critical for IgE binding of almost all patients sera tested. This residue appears to be essential residue for preserving the structure of a cross-reactive IgE epitope. (Scheurer et al 1999). Strong thermolability was shown by CD-spectroscopy (loss of secondary structure at 70°C) and by IgE-reactivity of thermal processed food. Lability to enzymatic digestion was shown by pepsin treatment of cherry extract and recombinant Pru av 1 (stability: Pru av 3 > Pru av 1> Pru av 4) (Scheurer et al. 2004). Influence of thermal processing and nonenzymatic as well as enzymatic browning reactions on Pru av 1 was investigated by Gruber et al (2004). Thermal unfolding of the allergen occurred at a calculated mellting temperature of 66.3°C. Correct refolding occurred after cooling. Allergenicity of Pru av 1 was reduced by enzymatic polyphenol oxidation and Maillard reaction induced by carbohydrate breakdown products. As a consequnece of high sequence identity to other members of the Bet v 1 family IgE to Pru av 1 cross-reacts with pathogenesis related proteins from parsley, potato, soya bean, Mal d 1 from apple, and Bet v 1 from birch pollen (Scheurer et al. 1997, 1999). Allergen properties & biological function:Pru av 1 is a member of pathogenesis-related protein group 10. These proteins are expressed upon pathogen attack, stress and abiotic stimuli. Although, Pru av 1 precise function is not known, same evidence is given that Pru av1 is involved in steroid binding (Neudecker et al 2000; Neudecker et al 2001). Recombinant Pru av 1has been purified using a heterologous expression system, E. coli, as a His tag fusion portein and further purified by metal chelate affinity chromatography (Scheurer et al. 1997). Pru av 2 was purified by reverse phase HPLC on a C8 (Hypersil WP300,, 8x250mm, 10um particle size) using 0.1% (v:v) trifluroacetic acid as the solvent and eluting the TLP with a linear gradient of propan-2-ol (0-80%, 60min, 1.0ml/min). (Insclag et al 1998). Pru av 2 has a pI of 4.2 (Fils-Lycaon et al. 1996). Fils-Lycaon B.R., Wiersma P.A., Eastwell K.C., Sautiere P.
A cherry protein and its gene, abundantly expressed in ripening fruit, have been identified as thaumatin-like. Allergen Designation:Minor (Central European population) and major (Mediterranean population). Nature of main cross-reacting proteins:Sequence identity of Pru av 3 with that of almond (89%), peach Pru p 3 (87.9%) and apricot Pru ar 3 (85.7%) indicates that IgE cross-reactivity between these proteins is likely. Plant nonspecific lipid-transfer proteins are thought to be involved in transport of fatty acids both intracellular and extracellularly and of cutin monomers to the cuticular layer of leaves and fruits. There is an expandable cavity between the four alpha-helices which can bind one or two lipids. nsLTPs have also been reported to act as plant defense proteins against bacterial and fungal infections and form the PR14 family of pathogenesis related proteins. It is possible that a lipid-like post-translational modification is involved (Lindorff-Larsen et al. 2001 ). Pru av 3 has a pI of 9.22. There are only few studies on the stability of profilins most of them on celery profilin. Compared to other allergens, profilin is a moderately stable protein, more resistant than Bet v 1 homologues but less stable than lipid transfer proteins or cross-reactive carbohydrate deteminants of glycoprotein allergens. Allergen purification:Recombinant Pru av 4 has been purified using a heterologous expression system, E. coli, and further purified on PLP-coupled sepharose.